—There’s a new site director at Google’s Kirkland, WA office. Brier Dudley reports in The Seattle Times that the new head honcho is Chee Chew, 42, a user interface expert and MIT graduate who joined Google in 2007 after 14 years at Microsoft. Chew replaces Scott Silver, the former Kirkland site director who transferred to Google’s headquarters in Mountain View, CA. The director of Google’s Seattle office, located along the ship canal in the Fremont neighborhood, is cloud computing expert Doug Orr, as we first reported late last year. 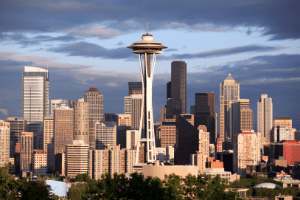 Of course, there are a ton of smaller competitors in Seattle these days too—along with the appetites of Microsoft and particularly Amazon, which is on a path to reach 20,000 people or more in Seattle in the coming years. One of those competitors is Facebook, which has a large engineering office in Seattle (and which Partovi helped get off the ground). —Amazon has been a staunch holdout against collecting local sales taxes for many years, but that’s begun to thaw in the past couple of years. It seems clear that the Seattle-based retail giant is now ready to take on a task it once deemed too complex and not legally defensible in order to build out its shipping operations and get a national deal on sales tax uniformity passed by Congress. The latest chip to fall is a big one: California, where Amazon started collecting sales tax this weekend. Legend has it that Amazon is actually located in Seattle because it was close to the Golden State’s treasure trove of consumers without actually being in California—meaning Amazon could ship things to those folks quickly without having to charge them sales tax, gaining a nicely competitive price. That was probably a crucial factor for some consumers in the days when online shopping was scary and weird. But it’s not anymore, and Amazon’s resistance to collecting taxes in places where it has shipping operations in particular relied on reasoning that could charitably be described as tortured—the company insisted that the Amazon.com retail site and the Amazon fulfillment services that handled the orders were merely unrelated branches under a larger parent company. I don’t think this will be as big a deal as some people seem to think. This New York Times story, for instance, goes way too far in declaring that Amazon’s tax gap was “perhaps its biggest competitive edge.” These days, Amazon relies on its strong brand, endless selection, fast and cheap shipping, easy returns, digital video services, and millions of credit card numbers to gain an edge in retail. Just ask everyone in Washington state, who’s been paying sales tax since the beginning. —I missed this one the first time around, but RealNetworks’ GameHouse division is betting even bigger on the newest version of crosstown neighbor Amazon’s Kindle Fire tablet—just as makeover-minded Real starts operating the games unit and two others as standalone businesses. The Kindle Fire is mostly thought of for consuming digital media like books, videos, and games. And GameHouse says it’s found success there, touting its Doodle Jump title as one of the Top 20 paid apps on the Amazon app store. That game will return on the new Kindle Fire HD, and will be joined by another title, Collapse. GameHouse also is distributing a word game, TextTwist, on the e-ink Kindle book reader devices for the first time. The holidays are a big time for any consumer retail business, including video games, but this season will be especially crucial for GameHouse. RealNetworks announced in early September that it was going to operate the GameHouse, RealPlayer, and software-as-a-service businesses as separate business units. That’s a move that could set any or all of those branches up for a spin-off. It’s all part of the latest turnaround plan for Real, which is back under the interim leadership of founder Rob Glaser.